There are two sparrows preening as they perch on two small branches of the Malunggay tree that grows in our small backyard. I have a good view of the two silent birds. There are few members of the avian family that visit the backyard now. Our country, the Philippines, is in the midst of the rainy season, and the European sparrows rarely visit and if they do, they come singly or in pairs. The birds had done their nesting work in the summer. I miss their lilting chatter that began when it was still dark, as they went about their work of collecting nesting materials. I feel a kinship with these avian friends. I too, went into hibernation after the summer. I had to break my commitment to blog daily this whole year. I’m just glad I made it half-way, through June. Breaking a commitment to myself was hard to do, but it had to be done. I was beyond exhausted from a year of heavy therapy work. I would have lightened my work load if I could, but there are times in our lives when events seem to reach a crescendo, and the best thing we can do is to ride the waves as best as we can. I have been an energy therapist long enough to know that when the energy is needed, it will be there, but it wanes when the need lessens so I didn’t complain when the workload became heavy. It began to lessen in July when my clients, most of whom are expats, one by one left for abroad for their summer holidays. It was a signal that my body soon recognized, and the energy within me waned and I fell ill for a few days. I always reward myself for getting well, and my gift to my self this time was the Zuki theme for this blog. I thought I was going to blog my way through the rest of the year. But the energy to blog daily soon fizzled out. That was a big surprise because I was looking at two months of having a very light work load. I thought I would have the time and energy to do more writing. I did actually do some writing. 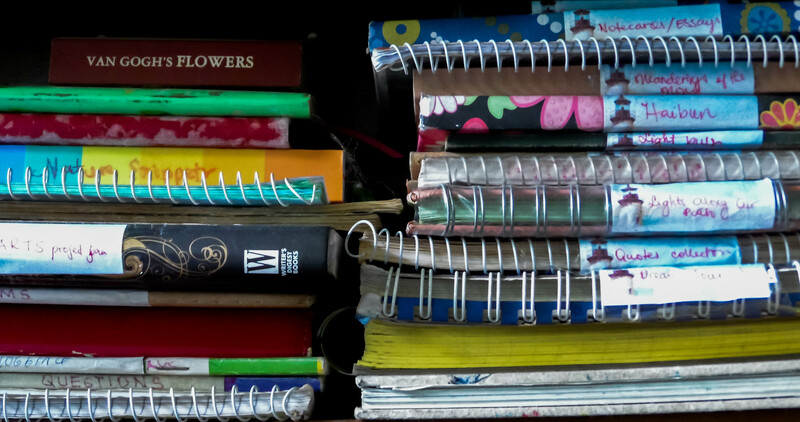 The journals that I kept in a basket beside my desk seemed to ask for more attention. I took them out of the basket and placed them on the shelf in my writing commode. Whatever energy I had to write went into writing on those journals. There was none left for blogging. But there was a strong need to search for books that would educate me on my new-found writing niche. I soon realized that my writing life was changing, mainly because I had found my writing niches – those places in myself and in the world that give me the right and reason to write, as well as a new focal point: ecospirituality. An old writing self was dying, and a new one was waiting to be birthed. Journaling was the link that bound the two. It was my only link to the writing world for sometime, as I allowed the body to rest and heal. In the midst of this writing limbo, I took comfort in Andi Cumbo-Floyd’s reflections on resting: “At the very least, our most important words need to sit a while. We need to let them rest, let them gather energy, and give ourselves space to consider carefully and deeply what we have said before we share it. Not to mention, giving our work space means we can fill in gaps and correct errors that we can’t see when we’re in the throes of writing. And I am still there, in that space where I need to fill up again. My clients are back, but my personal circumstances have changed and because of that, my priorities have also changed. I have decided to strike a balance between working and writing. I am in a new writing landscape, eager for lessons and looking for mentors. They come without fail when we are ready – the mentors and the lessons. I have found the perfect online writing course for this phase of my life: a nine-week memoir writing class with a very astute mentor. It feels like the right time to write a memoir because my whole life is changing, and all aspects of my life – the personal, professional and writing lives – are taking on different hues and forms. I want to write a memoir as a form of soul work as I cross the threshold between the old and the new. Writing the first draft of a spiritual memoir are baby steps I am taking towards inhabiting my writing niche. Like the two sparrows, I am preening my writing self. Along with the memoir class, I am also reading two books on spiritual writing. It feels like the energy to blog is back, but I know I cannot go back to daily blogging. The energy to write is spread over several writing endeavors. Still, it feels great to be blogging again. something that we come to be at with rest in our bones. I wish you all the best as you begin this new phase, Rosanna. I love the idea of writing a memoir as part of soul work, though I’m not entirely sure what that means but it sounds worthy and interesting. I’m also, selfishly, very happy that you’ll be blogging again, even if intermittently. It’s good to see you here. Thanks so much Susanne. It’s a bit overwhelming at times…memoir writing is an eye opening experience and just now realizing how much it affects the writer to see his/her life from the point of view of memoir. In time I hope to write a post about memoir as soul work. Beautiful and wise, Rosanna. Thanks for sharing my quotes, but mostly, thank you for taking care of you. We need you well and strong. What a beautiful statement about the process of growth. It reminds me of the changing seasons – the ripeness of summer energy, the drawing back of autumn, the dormancy in winter that prepares for the surge of spring. It seems you are following those circular seasons in your heart, ready to reawaken in a new writing life, at the very least. I can sense that you’ve found your niche and so look forward to reading as this adventure unfolds for you. Thanks Diana. It’s a big challenge once the writing life demands more….so much changes are necessary …taking it one step at a time….